Shamrock key and Trinity knot lock charms on this Celtic necklace are accented with crystals. 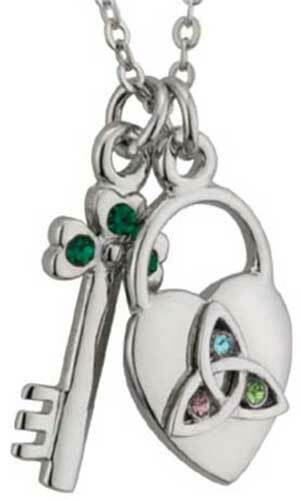 This rhodium plated Celtic lock and shamrock key necklace features multi-colored crystals and measures 7/8” tall. An 18” long rhodium plated chain is included and the necklace is gift boxed with shamrock and the Celtic knot history cards, complements of The Irish Gift House. This Irish pendant is made by Solvar Jewelry in Dublin, Ireland. Irish fairy necklace features a rhodium plated design that is enhanced with a dangling shamrock along with crystal wings.